Wow! Can you believe it? I'm actually posting my Mojo Monday card on Monday! I was able to get it all done before Jonathan got home from pre-school this morning. It was a really simple card as you can see. It's actually a 4 1/4 x 4 1/4 square card. I like doing this size when I do a square card because it still fits inside a regular size envelope. I know it appears that it has a black base; but it really doesn't. The base is actually white. I actually photographed the card sitting on a piece of black paper. I was actually quiet pleased with the results. You all know, I don't usually photograph cards very well. The card really was simple, so I'm not sure it really needs a lot of detailed explaining. The flower in the middle is from SU's "Fifth Ave Floral". I stamped it in black ink and then used R35, R59 and C1 Copic Markers to color it in. Beautiful card, I love the layout and the flower is so pretty! Thanks for joining us at Let's Ink it up and good luck! Thanks for playing with Let's ink It Up. Those colors look wonderful together. Wonderful card! I can't believe you covered all those challenges in one. It's very lovely and your details make it extra special! Beautiful card Dori! I love the clean look and the embossed background! Thanks for playing with us at The Pink Elephant! Such a beautiful card you've made! I love the classy look! Beautiful card, love your embossing and the simplicity of design, great work. Thanks for joining Let's Ink It Up for our first challenge, hope to see you again for our next challenge. The red really pops here with all that gorgeous white embossing, beautiful card, thanks for sharing with us at Lexi's Creations this week. PS: I have blog candy at my blog www.justsoducky.blogspot.com if you're interested. This is very cute! Love all the embossing you have done with this! Thank you for playing in our first challenge at Let's Ink It Up! Simple can often be very beautiful, and this is. Thanks for playing along at Let's INk It Up. 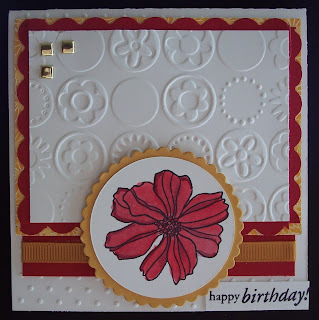 I love the embossing on this card, the different designs look great together. What a beautiful elegant card! Thanks for joining in the Pollycraft Challenge this week. Elegant card, like the embossing. Thanks for joining us at Sentimental Sundays.